« In which Warhammer Online kindly bribes me to return, and I accept. Like me, you’re probably sick of the omnipresence of Evony advertising, on Google’s ad network the last few months. Chances are there’s one staring at you on this page right now, as no matter how many of their advertising URLS I block from showing here, they always seem to have more. Until recently it was called Civony, and they used pictures of real girls stolen from a lingerie catalogue, until someone noticed, and the complaints started pouring in. So they decided it was best to rebrand, and they’re now using drawings of women in lingerie instead. None of that advertising has the slightest thing to do with the game, where there are no Queens, no love interests, and no willing hand-maidens wanting you to “play me now, oh Lord”. Oh well, I guess it gets the clickthroughs (or it did before everyone became completely inured to them). Update: I’ve revisited this topic while looking at Kingory. Update: And Maltheas is pretty upset about Evony stealing the picture of his Queen for advertising. Update: Evony has decided to take on Blizzard, by stealing the World of Warcraft Intellectual Property with their new game, World of Lordcraft. At its heart, Evony is much like other browser games in the nation-building genre, where you construct buildings, research technologies, and train troops to go bother other players. Unlike most though, rather than existing on a theoretical world, where you’re an equal distance away from everybody, Evony places you on an actual map. A massive one, with multiple separate regions. That is the one interesting new (to me at least) advancement Evony makes. One distinct flaw in comparison to other browser based games, in my opinion, is the inability to queue actions, such as building and research. This means that you cannot just leave Evony and go do something else. Not if you want to survive, at least. This may be due to the desire for people to spend money on in game currency to buy items to reduce build time, but it also means that Evony is far from a casual game that you can pop into once per day. As Evony does not appear to use advertising, its only visible means of support is for folks to spend money on buying in game currency, so it is not surprising that the gameplay pushes you to do so. As I mentioned, Evony was originally called Civony, and it is not hard to see who their inspiration was. If by “inspiration”, you mean the place where they blatantly stole stuff from. 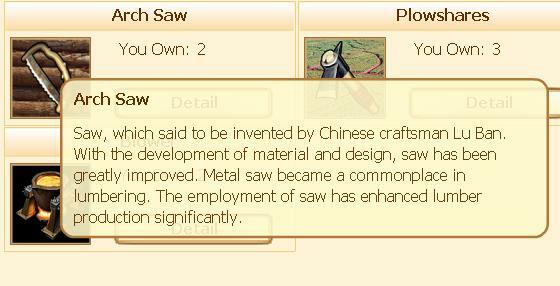 Like Civilization 4, each technology description begins with a quote. 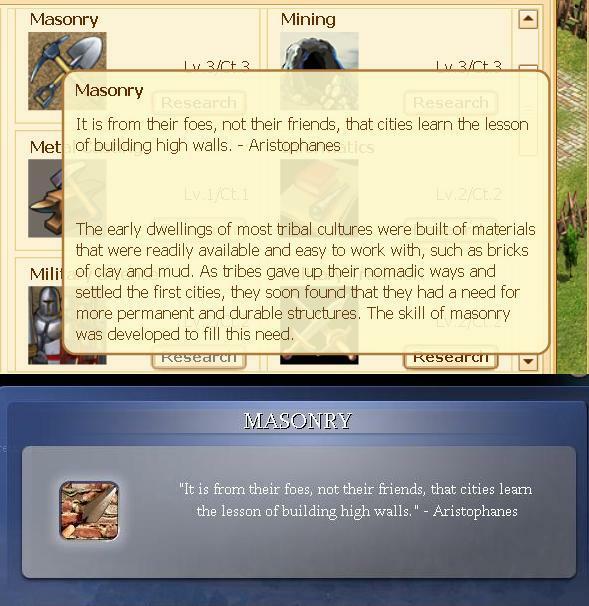 In fact, like Civ 4, each technology description begins with the quote from Civ 4. I’m almost surprised Leonard Nimoy isn’t doing a voice-over, though I hear him in my head when I read them anyway. Lifting all the quotes straight from Civ is exceptionally lazy. Oh, and most of the descriptions are lifted straight from Civ 3 or 4 as well. The building and terrain graphics until recently were lifted straight from the Age of Empires series. They have recently changed, but whether they’ve just stolen them from something less well known, or actually made them themselves, I know not. My guess would be on the former. Evony is a mildly entertaining nationbuilding game, of the sort you’ve probably played a dozen of. It is fun to play (I’m still pottering about with it myself), but it is not worth spending money on. That everything that is of decent quality seems to have been stolen from somewhere is my main concern with Evony, and that makes me feel that I probably do not ever want to give them my credit card details. I suggest you do the same. We should not reward companies that hide behind China’s lack of respect for copyright law, or indeed their tolerance for credit card fraud. A fuller review of Evony’s game mechanics can be found here. What is iEvony Client and how does it work? iEvony Client is software that easily, quickly and safely delivers a private game invitation to your friends. With just a simple click, iEvony Client will automatically import your entire buddy list from MSN, Yahoo or Skype IM. iEvony Client allows users to choose their selected friends and send them a short invitation. The software will record all the invitations and translate them to credits for you! Is iEvony Client Safe to use? iEvony Client is absolutely secure! iEvony Client WILL NOT collect any private information or addresses from users. iEvony Client WILL NOT install any other programs your computer. iEvony Client is completely safe! So don’t worry, kids! iEvony just wants all your instant messenger login details so it can send messages to people on your behalf. Because, you know, you couldn’t possibly have sent your friends a message about Evony without installing a mysterious application on your PC. My pro tip would be, if you must play Evony, do not allow iEvony anywhere near your computer. If you have already used iEvony then you should change your instant messenger passwords right away. Update: Now Maltheas has gotten in on the act here. 63 comments to Evony – A patchwork of stolen parts. Nice page. Thank for sharing this info with us! Super blog do you have! Thanks for informations!